The YFANET squat has come under attack by fascists at about 2330 hours local time tonight. Reports now indicate that the intruders have been chased away from the occupied building; we are expecting a report from the comrades who were inside very soon and will be publishing it here once it’s out. What follows is a rough translation of a statement put together by people in YFANET tonight. At around 2300 hours tonight and while the assembly of YFANET was under way, around 20 fascists with sticks, helmets and hoodies attacked the squat. They tried to enter the space of the assembly but were successfully pushed back by comrades; they then tried to burn various parts of the squat. 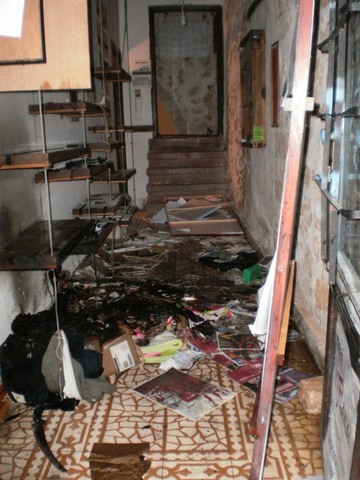 The damage that they caused was relatively small – a burnt scooter, some furniture and the like. None of us has been injured. After this, various cops started arriving outside the squat, while people in solidarity also started to gather. The fascists disappeared. There was tension between the gathered people and the cops; at some point, with no previous provocation, riot police arrived, attacked and threw much tear gas in the squat. At this moment there are many people outside the squat, more than 200 people and the atmosphere is very comradely. Cops and fascists are nowhere to be seen. One girl was detained while away from the squat, they probably suspected her as being a person in solidarity. There was one detention of a woman near the squat, but will be set free. Hundreds of people in solidarity arrived in YFANET shortly after the attack happened. Many remain in the area of FABRIKA YFANET, and after having a short assembly, decided another main assembly for tomorrow 6pm in the squat. There is another information for 2 fascists trying to throw a molotof cocktail at Orfanotrofio squat, that is also in Toumba (same area as YFANET in east Thessaloniki), but they were chased by people from inside. After this many comrades were walking around the squats and some fascists were chased, but most were saved by police forces. I would like to remind that YFANET squat (old factory) is the largest occupied area in the country, was occupied in 2004, and since two years ago the state has announced that they want to use the place, that triggered actions and a demonstration in solidarity. PS1. Also yesterday a mechanism with gas canisters was placed near the squat but did not damage anything. PS2. The collaboration of fascists and the police is once again obvious, but this is nothing new and does not sound strange of abnormal anymore. Coordinated attack together with fascists and cops against Yfanet Fabrica Squat in Thessaloniki during the night of Tuesday 9th February. Fascists tried to set on fire the squatted factory but they were perceived by people who were inside and chased them away. At the same time, the area got surrended by special pigs’ forces who started throwing chemicals and stones inside the building. Men and women gathered in solidarity at the Polythecnical school of Aristoteleio University and directed collectively to the squat so they chased the cops away from the spot. This was the second attack during the day, after the dawn of Tuesday when “unknown” parastatists tried again to set the squat on fire by putting gas-bottles in a garbage bin in front of the building. Mass Media in turn, with misinformation as a weapon attack in their way trying to mislead the public mind and completely reverse the events. 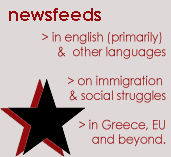 Last Monday the fascist parastate made a double attack in Greece with the bombing of an antiauthoritatian centre in Salonica, and the pogrom against the arab community of Neos Cosmos in southeast Athens. The fascist para-state has waged a double attack in the two major Greek cities, Athens and Salonica, on the night of Monday 23 November with police providing impunity to the perpetrators and the bourgeois media systematically under and misreporting the events. In the case of Athens, a mob of fascist thugs attacked the arab community of Neos Cosmos, a southeastern neighbourghood of the metropolis, in the area of the proletarian blocks next to Syngrou avenue after 21:00. The fascists shouted racists slogans while beating the arabs on the street and smashing their shops, looting the tills and destroying their merchandise. The arab community was quick to mobilise a counterattack, chasing the fascists and forcing them to seek refuge in a block. At that moment strong riot police forces arrived which attacked the arabs, and let most of the fascists to escape. The cops then moved to detain 6 arabs and two fascists who claimed to be accidentally in the area playing basketball, and thus set free. Besides, the greek police in an attempt to cover the traces of its para-state accomplishes published a communique that claimed the clashes were between rival arab gangs. For many hours this story monopolised the news, and had to be revised in gross embarrassment after the intervention of left-wing parties and anti-racist organisations. 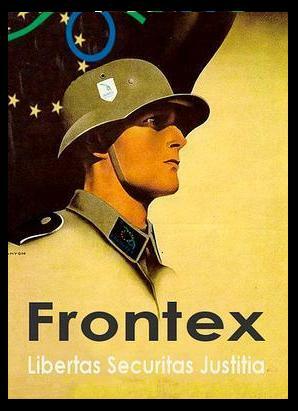 The Radical Left Coalition has accused the police of being “provocatively inert” allowing the fascists to escape. Three arabs are reported to be in hospital wounded. The attack comes as a climax of racist bigotry on the side of the extreme-right, which seems to be losing its ability to control the area of Agios Panteleimonas where with the support of the police it had created a white-only zone through stabbing and beating people of color. 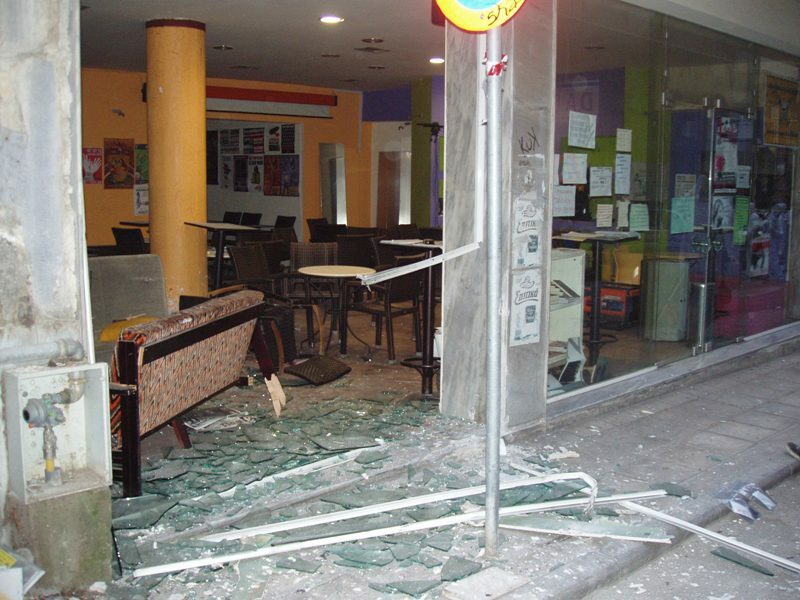 At the dawn of November 24, at 03:55 am, the free social space Buena Ventura (which hosts the assembly of the group Solidarity – Antiauthoritarian Movement) came under attack with a strong explosive device. 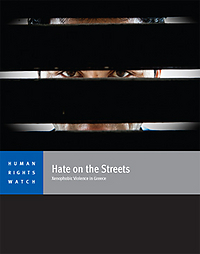 The way in which the device was placed reveals much about the morality of the perpetrators, a morality of murderers – since they did not just attack Buena Ventura, but the entire neighbourhood. In short, the windows of neighbouring blocks of flats were smashed by the explosion in a radius of 15 meters, while shattered pieces were whammed all around, posing an imminent danger to the lives of neighbours. Shattered pieces also hit three cars, which also highlights the murderous nature of the attack since any random passer-by could have been hit by them too. The attack comprises the tip of the iceberg – part of the framework of repression and of the blooming of para-statist action over the decades. It begins with the activity of the para-statist group “Karfitsa” in the 1960s and comes all the way to the placing of the explosive device at Buena Ventura. It becomes painstakingly obvious that free social spaces are being targeted – as approximately six months ago the haunt of the “Struggle Movement” (Sfentona) was also attacked. The method of the attack and the construction of the mechanism reveals that the perpetrators are the same, naturally raising the question of who will be next and – what scale of attack they will come under. Such attacks comprise expressions of a fascist-type logic that aims at the terrorising of people in struggle; a logic that finds refuge and legitimacy on a practical level in the coordinated attack launched by authority against everything last year’s December has given birth to. 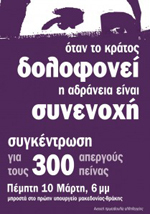 This witch haunt, the zero-tolerance schemes, the demonization of the anti-authoritarian movement both from mass media and from the state (from the mouth of the “Citizen Protector”, Minister Chrisochoidis), offers the strongest alibi for the activity of such circles, within and in parallel to the action of the state. In our face, the entire movement was attacked, since we consider the choosing of our particular group for the attack entirely random. In our place it could have been anyone who has chosen the paths of struggle and resistance. It could have been any free social space, haunt or squat. Through us, they attacked all those parts of society that revolted in December, since the symbolism of the date cannot be overlooked: the attack came only days after the mass mobilisations of November 17th and ten days before December 6th, marking a year from the assassination of Alexis Grigoropoulos. Our response cannot be other than the one given by society itself during last year’s revolt: The state and its dogs won’t scare us. Update: Today after a press conference by the Buenaventura centre, the bourgeois media made a u-turn, portraying for the first time the attack as “ultra-right paramilitary”. Forensics demonstrated that the explosive device was a pipe-bomb filled with metal shrapnel which would have caused certain death to any passer-by. The media claim that the explosion was felt all around the centre of the city and that the police in making investigations amongst extreme-right groups. 2nd Update: As a response to the fascist violence against the arab community of Neos Cosmos in Athens, a protest march took the the streets around the scene of Monday’s pogrom. It must be noted that one victim of the racist violence remains in hospital due to a stab in his eye with a knife. It could have been any free social space, haunt or squat. 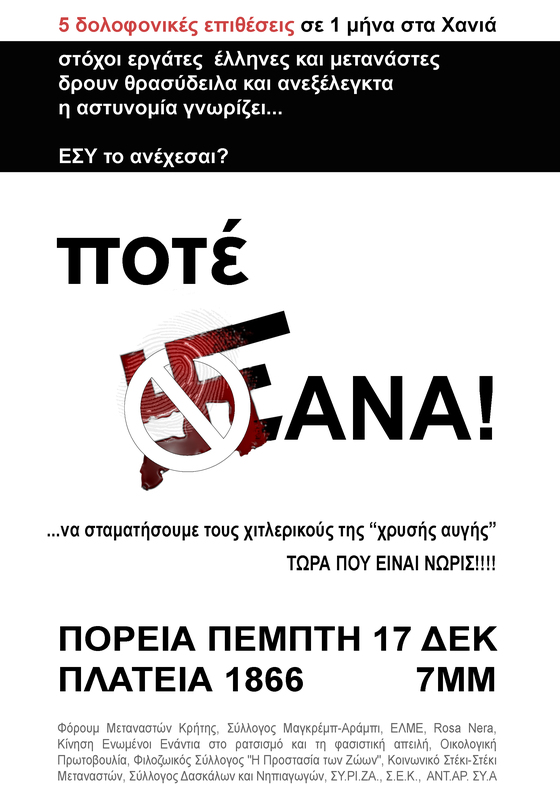 Through us, they attacked all those parts of society that revolted in December, since the symbolism of the date cannot be overlooked: the attack came only days after the mass mobilisations of November 17thand ten days before December 6th, marking a year from the assassination of Alexis Grigoropoulos.